Dr. Asmaa Seddik and Dr. Marwa Salman look forward to inviting you and your family to our Surrey dental practice. Our dentists, Dr. Asmaa Seddik and Dr. Marwa Salman, always put our patients first, focusing on personalized patient care and prevention so they can enjoy healthy smiles. Take a moment to get to know our dentists by reading the biographies below. 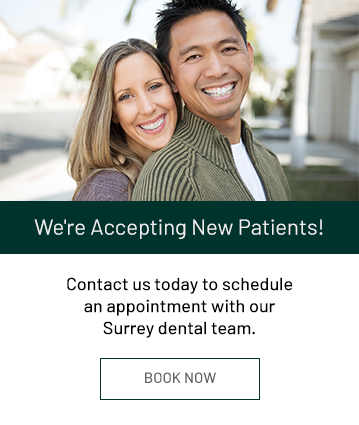 We look forward to welcoming you to our Surrey dental office! Dr. Seddik interest in Dentistry stemed from her passion in helping people and contributing to their wellness. By 2011 she earned her Masters degree in Oral surgery from Egypt after which she moved to Vancouver with her family. Dr. Seddik main focus is to provide high quality of dental care while reducing anxiety and minimizing discomfort. Dr. Seddik is a general dentist who provides variable aspects of dentistry. She is a Canadian Board Certified Dentist and an active member of the College of Dental Surgeons of B.C. In her free time, she enjoys hiking with her husband and two kids. At home, she enjoys baking and exploring new recipes. Dr. Marwa Salman earned her dental degree from the University of Manitoba in 2012 after receiving both her MSC of Oral Biology (University of Medicine and Dentistry of New Jersey), and her Bachelor’s of Dental Science at the University of Baghdad. She is an active member in the British Columbia Dental Association (BCDA), Canadian Dental Association (CDA), and the Academy of General Dentistry (AGD). As a bilingual dentist, fluent in both Arabic and English, she appreciates the multicultural qualities of Surrey and its close proximity to Vancouver, making a day in the city easy and fun. Giving back is important to Dr. Marwa Salman. She often provides charitable dentistry to underserved communities in Guatemala and Dominican Republic. Dr. Salman enjoys educating her patients about their oral health and helping them regain a comfortable and healthy smile. She comes from a dental family – her mother was a dentist and she grew up in the dental office environment. She never imagined another profession for herself. Some of the benefits of being a dentist include getting to meet new people, watching children in her practice grow, and learning about her patients’ lives all while helping them achieve a healthy, happy smile. Dr. Salman is married and has three children, Mariam, Faisal, and Ali.